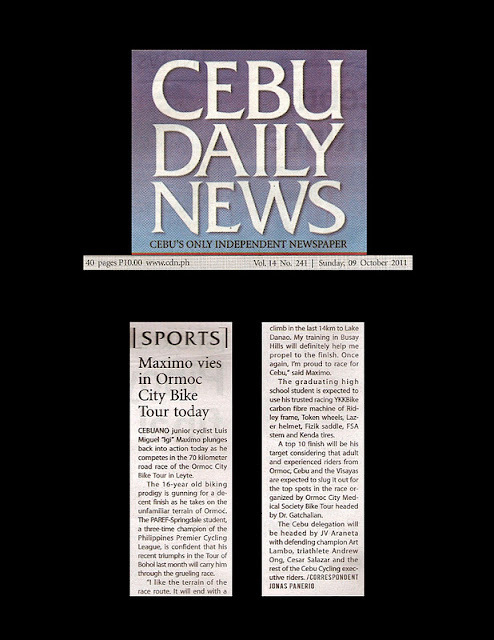 CEBUANO junior cyclist Luis Miguel "Igi" Maximo plunges into back into action today as he competes in the 70 kilometer road race of the Ormoc City Bike Tour in Leyte. The 16-year old biking prodigy is gunning for a decent finish as he takes on the unfamiliar terrain of Ormoc. The PAREF-Springdale student, a three-time Junior 15-U champion of the Philippine Premiere Cycling League, is confident that his recent triumphs in the Tour of Bohol last month will carry him through the gruelling race. The graduating high school student is expected to use his trusted racing YKKBike carbon fibre machine of Ridley frame, Token wheels, Lazer helmet, Fizik saddle, FSA stem and Kenda tires. A top 10 finish will be his target considering that adult and experienced riders from Ormoc, Cebu and the Visayas are expecting to slug it out for the top spots in the race organized by Ormoc City Medical Society Bike Tour headed by Dr. Gatchalian.